At Tuesday's Rotary luncheon District Governor 5890 Rhonda Kennedy was on hand to welcome fourteen Rotarians who joined the ranks of The Paul Harris Society. 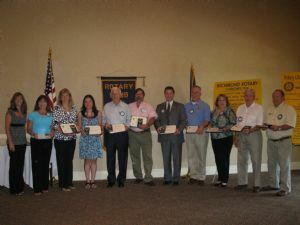 Rhonda Kennedy, District Governor 5890, Lisa Regan, President Richmond Rotary, Carol Whileyman, President Elect Richmond Rotary, Dr. May Tape, Bob Sunday, Steven Onstad, Mark Magee, Don Dulin, Mary Doetterl, Bob Crosser and Jim Tucker. Orin Covell, Mike, Lytle, Malcolm Smith and Ivora Thompson. The Paul Harris Society is named after Paul P. Harris, founder of Rotary International. Paul Harris formed the world's first service club, the Rotary Club of Chicago, on 23 February 1905. His intention was to recapture in a professional club the same friendly spirit he had felt in the small towns of his youth. The Paul Harris Society is a special district recognition program designed for Rotarians who wish to support The Rotary Foundation in a more substantial way each year. The Paul Harris Society recognizes Rotarians and friends of The Rotary Foundation who annually contribute $1,000 or more to the Annual Programs Fund, PolioPlus, and PolioPlus Partners, or the Humanitarian Grants Program.